Over the years enterprise storage configuration has come through many waves of innovation and today offers many options. This article will compare storage costs associated with deploying a Storage Area Network (SAN) and Direct Attached Storage (DAS) in the enterprise, as well as demonstrate that sometimes DAS is not a cost-effective option. We discuss the cost of DAS & cost of SAN deploymenent. The question of cost is often raised when considering whether to deploy direct attached storage or storage area network. First impressions usually highlight DAS as the cheaper alternative, but as the storage requirements grow into many terabytes, this consensus may not always be the case. Although we have partnered with Dell for our hardware, costs across the industry are relatively similar so you can assume that the following data will still apply to your enterprise, plus or minus 10%. We usually purchase DAS in two configurations, PowerVault MD1000 with a total capacity of 4.5TB using 300GB SAS drives, or the PowerVault MD1000 with a total capacity of 7.5TB using 500GB SATA drives. For comparison reasons I’m also including the market rate in USD as well as a chassis configurations with 146GB & 1TB drives. As you can see from the table below, the 1000GB drive configuration is the most cost effective (Cost of DAS) when it comes to $/GB. Of course this wouldn’t be the optimum configuration if you wanted a high throughput Database or Messaging disk system. Interestingly it is actually more expensive to use 146GB than 300GB SAS 15k drives. Keep this in mind when specifying your next high end storage system to keep your Cost of DAS to a minimum. As I write this article, we are pushing the 1TB mark for SATA drives and 400GB for SAS drives. We can see that the capacity of the 1TB disks make the SATA configuration much better value for money, and we pay only $1.5 per GB of storage. True, at first the Cost of SAN doesn’t look impressive in comparison to the DAS, but check out the next section which will explain what happens as we add storage. Another point to mention is that although slower, SATA may still be a good choice for applications requiring high throughput because a SAN can have many GB worth of cache - boosting performance far more than a similarly configured DAS. But don’t underestimate the performance of DAS. If properly configured, DAS still offers better response and throughput for disk intensive applications. The reasons behind this are based on the fact that in order to keep utilization rates high on a SAN, your LUNs may not rest on dedicated disks. Meaning your SQL LUNs could be sharing disks with your File Server LUNs. By guaranteeing exclusive service to one application, DAS can outperform SAN deployments. As your storage requirements grow, so do the costs associated with expanding the DAS and SAN infrastructure. 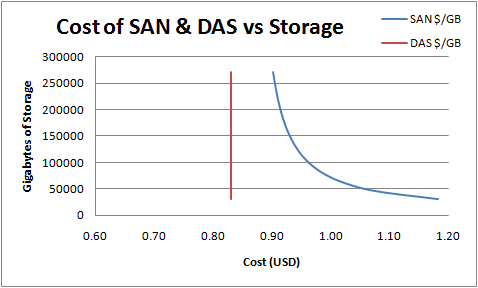 But unlike DAS, where costs are linear no matter how much you expand the storage, SAN costs actually shrink as you add storage. Take a look at the following chart, which demonstrate this better. As you can see, the DAS storage costs are set at $0.83/GB no matter how much storage you procure (obviously there may be some savings if you negotiate with your vendor), giving the linear relationship. Each time you want to expand past the 15 drive enclosure limit, you must purchase an additional enclosure + drives. In contrast, the SAN chart displays an exponential relationship which in our example will settle towards $0.88/GB. The reason why SANs exhibit this type of behavior is because we don’t’ need to purchase new base components each time we have a requirement to expand storage. With the initial deployment of the SAN infrastructure you would have purchased the base components, such as: storage enclosure, FC switches, storage processors, cache memory etc. The only new components which need to be added are the physical drives and storage shelf (if needed). One of the best selling points of SAN's is its ability to efficiently utilize the disk storage. Because we are all quite apprehensive about running out of disk space, we tend to over-spec our requirements and purchase far more disks than are required. This doesn’t do much for efficient use of the storage, particularly when we are paying a premium for high spec disks. 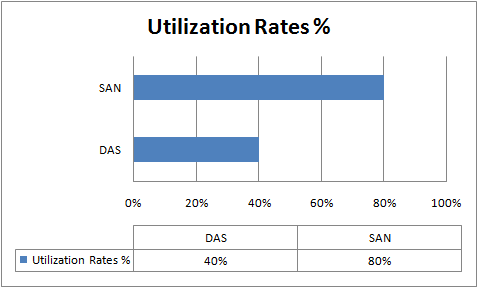 Even if we are generous and make the assumption that most DAS storage arrays are running at 50% utilization (TheInfoPro.net Fortune 1000 survey indicates that DAS utilization is between 30 - 40%). This means the true cost to the business for DAS is double that initial $0.83/GB we mentioned earlier because we purchased more than necessary. When storage is centralized, a SAN can run at 80% capacity and still have ample spare space for those emergencies. For example, on a 32TB SAN, running at 80% utilization, still has 6.4TB of spare capacity, far more than DAS could provide cost effectively. 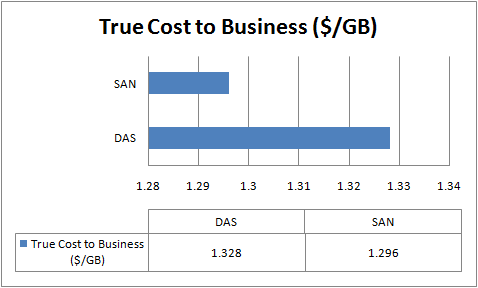 The table below shows the comparison between the final cost of DAS vs SAN when taking into consideration utilization rates. The results in this table are based on a 45TB configuration using 1000GB SATA drives. SAN provides data mirroring across multiple sites. This will be a key feature in business continuity and disaster recovery plans. SAN provides tools to manage extremely large volumes of storage. Imagine trying to manage 64TB of storage in a DAS configuration. SAN is scalable. DAS arrays have limited capacity and are difficult to grow. SANs have a larger capacity (64TB for the Dell AX4-5F) and can dynamically allocate storage as requirements change. At first glance the cost of DAS may seem like the perfect choice for mass storage at an attrictive price. However, as your storage needs expand it is worthwhile to understand that storage costs are not the only factor in deciding total cost of ownership (TCO) and why a SAN may offer better bang for your buck. In conclusion the cost of SAN is far smaller than the cost of DAS in the long term.